Known as the City of Angels, this beautiful city was founded in 1531, built with the effort and the art of the region natives and spaniard entrepreneurs. The city of Puebla is also the capital of the state of Puebla, and is located about 75 miles southeast of Mexico City, surrounded by two snow-capped volcanoes, the Popocatepetl “Popo”, and Iztaccihuatl “La Mujer dormida” or “Sleeping woman”. With one of the most artistic arquitectures, leaving an important legacy to the world, sits the grandiose Historical Center of the City of Puebla, which was declared a “Cultural Heritage of Humanity” by UNESCO in 1987, with a unique blend of European and Arabic styles with the flavor of native culture, where you can find some of the most amazing structures and fine buildings, like the Cathedral, a true architectural jewel, with a front facade built out of a black limestone, with two towers, considered the highest in Mexico and 14 interior chapels. 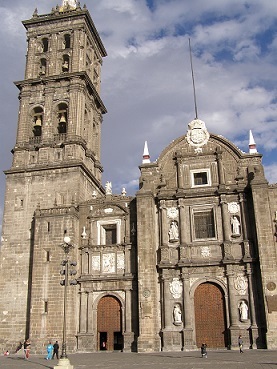 The majestic city of Puebla has one of the most renowned gastronomies in Mexico, for its own unique combinations of European, Arab and indigenous influences. Puebla is world famous for one of the most unique dishes in Mexican Cuisine: Mole Poblano. Following with legendary dishes as Chiles en Nogada and the typical candies including camotes, made with a mix of sweet potatoes and sugar with added flavors like strawberry, obleas, jamoncillos, among other favorites that you can find in ” The street of candies”, Yes! you have an entire street, to enjoy the variety of traditional mexican candy offered. La Plazuela de los Sapos, in the heart of the city, surrounded with amazing elegant colonial buildings, hosts artists and craftsmen’s workshops and antique shops. On the weekends a “tianguis” a “flea market style” is set up, where you can find the most rare objects, antiques and unexpected items. Surrounding the area you will also find some of the best restaurants and bars in the city offering the best of local foods. If you are antique lover, this is your paradise! Puebla is so rich in culture, history and contributions to Mexico, that we can count. Full of life, wonderful people, amazing architecture, street of candies, amazing gastronomy, great nightlife, and wonderful weather, unbelievable views, incredible the only way to experience this is by visiting Puebla. Discover Puebla!